You may not have heard a lot about Brother 3034D, but you may have heard about 1034D. This one is even better than 1034D. It is slightly expensive though. Brother 3034D is the bigger version of the ever popular Brother 1034D serger. We all know how good a serger is the 1034D. It is a rock star among sergers, mainly because of its stitch quality and affordability. Now, 3034D is a slightly more expensive overlock machine with more features for customization. The stitch length and width range is more in 3034D in comparison with 1034D. Let us see whether it has the same quality of its younger cousin. 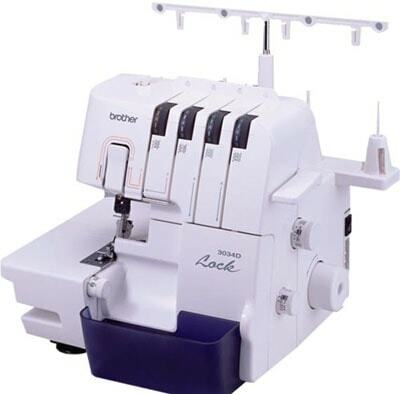 Brother 3034D is a 3/4 thread serger with two needles. The stitch length can be adjusted in the range 0.8 – 4.0mm. The stitch length adjustment dial is provided on the right hand side of the machine. The stitch width can be set between 3.0 – 7.0mm. Presser foot pressure can be adjusted using the adjustment screw. The differential feed range is 0.7 – 2.0mm. The knife is retractable, if you don’t want to trim the fabric while sewing. The color coded thread guides make threading easy. Brother 3034D has a motor that can deliver 1,300 stitches/min. This is the same motor that you will find in a range of other Brother sergers. The machine is pretty lightweight. It weighs just 12 pounds. The best thing about this serger is that it uses regular sewing machine needles unlike some other sergers. READ Brother ST531HD Sewing Machine Review - Is It Really Tough? There is a small storage compartment to store some of your accessories. It is not a huge one though (pretty basic). One good thing about 3034D is that it has free arm capability for sewing tubular areas (I have seen some expensive overlock machines without this feature). There is a waste collector trap to collect the remaining fabrics. So your table always looks clean. Even though Brother 3034D is a lightweight serger, it is well built. The build quality is good (better than 1034D) and the machine is very stable at high sewing speeds. Where this serger scores high is in ease of use. Like 1034D, this one too is an easy machine to live with. Threading is easy and effortless (all dials are conveniently located). As far as ergonomics is concerned, 3034D is almost picture perfect. It is not an intimidating machine at all. The stitch quality is excellent. It gives a real professional look to projects. Rolled hemming is also very easy. The work space on offer is quite large in comparison with competition. So there are no worries in that department. Not a lot to talk about. Probably you can say that it misses out on a carrying case. Yes. Brother 3034D like its younger cousin 1034D, is a quality serger which provides the professional finish you need. Even though it is slightly on the expensive side, I think it will be worth spending.